I feel like I’ve been a bad blogger the first few weeks of school. It’s not that I don’t have stories to tell. I’ve just been so busy with my little ones that I’ve forgotten to take any pictures. That must mean that I’m too busy teaching right?!? I’m going to do better this week…or at least I’m going to try. 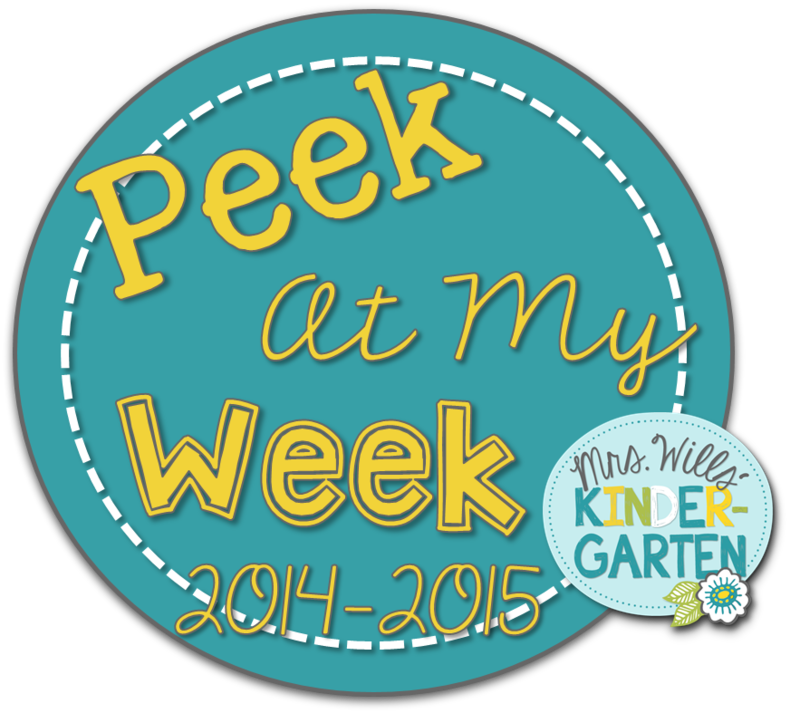 I’m linking up with DeeDee from Mrs.Wills Kindergarten to show you my weekly plans. 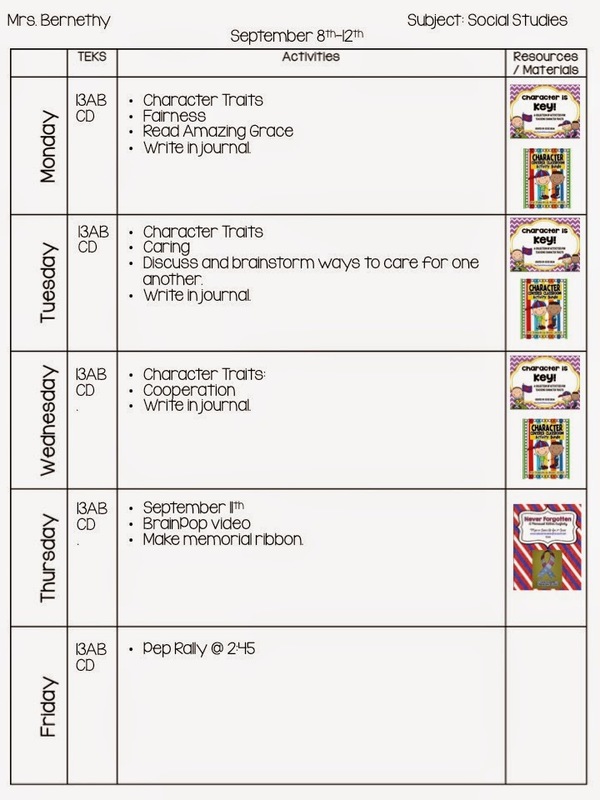 My lesson plans do not have to be super detailed. I actually don’t even have to type my plans up. 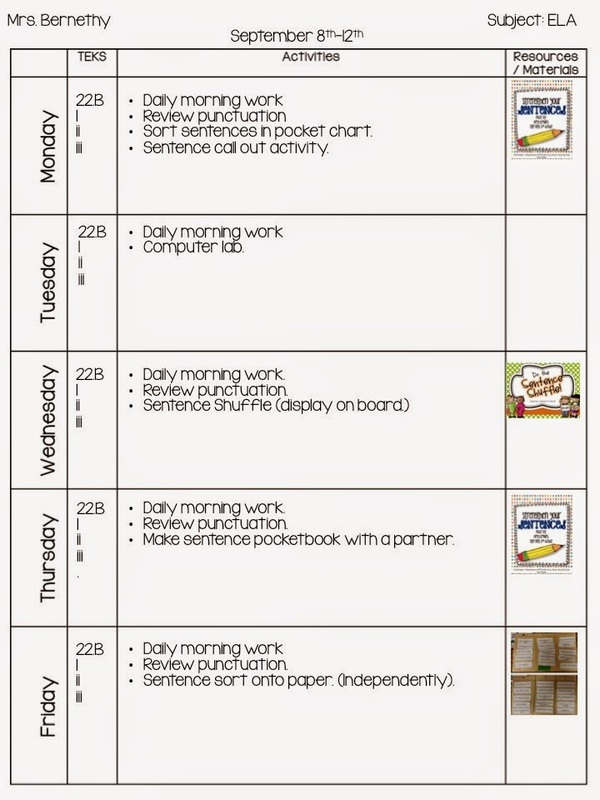 I can just copy my lesson plan pages and turn them in. I choose to take the extra step and type them up. They aren’t fancy at all. I keep them simple to turn into my principal. I basically just list the skill and the name of the activity we are doing at the time. Click on any of the pictures below and it will take you to my plans directly so you can click on the links to find the materials I use to supplement with. Here’s a sneak peek at my schedule. We use GoMath curriculum. I’m not 100% sure if I like it yet or not. There is a gap this year because our TEKS (the Texas standards) changed. I can’t use a lot if it yet until new concepts have been taught. 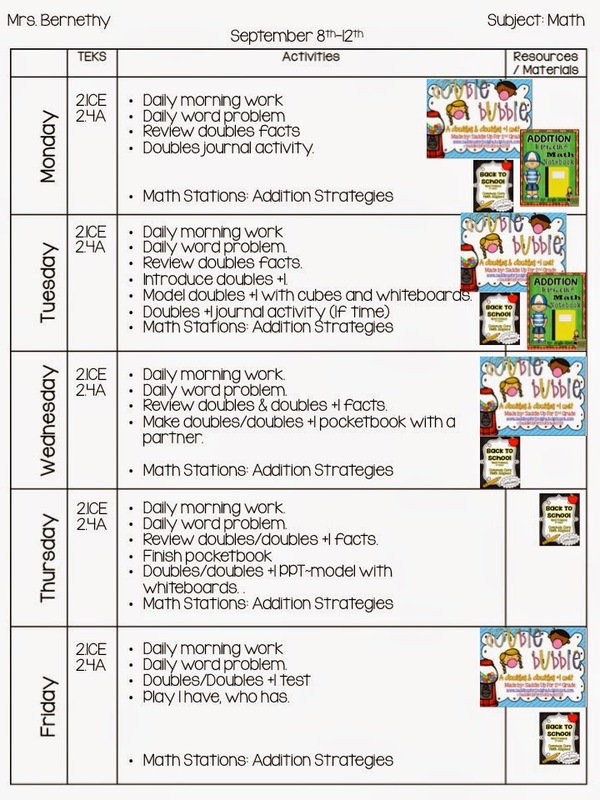 The week we are working on our doubles and doubles +1 facts. We are mostly using activities from my Double Bubble Unit. Our math stations came from here as well. In ELA we are reviewing types of punctuation. We use the ELA that goes along with our Journey’s series. I pull what I can from it, then supplement with materials from TPT. Our day was extended by 20 minutes this year so I’m trying to do writing everyday. I hope I can stick with it. I have 25-30 minutes to do it, but we go to lunch right after so I have to stop and let them get ready for lunch with a restroom break so I really only have about 15-20 minutes each day. I’m going to try to keep activities simple at first. 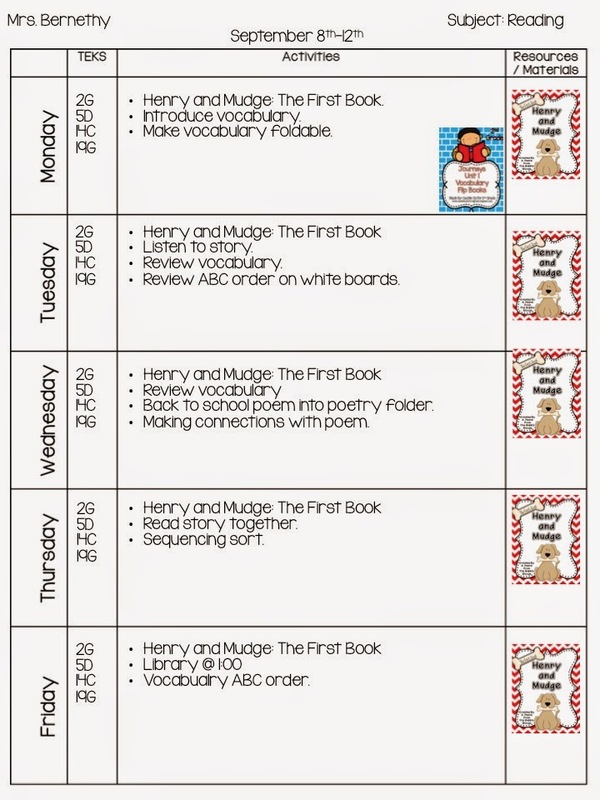 We use Journeys for our reading curriculum. 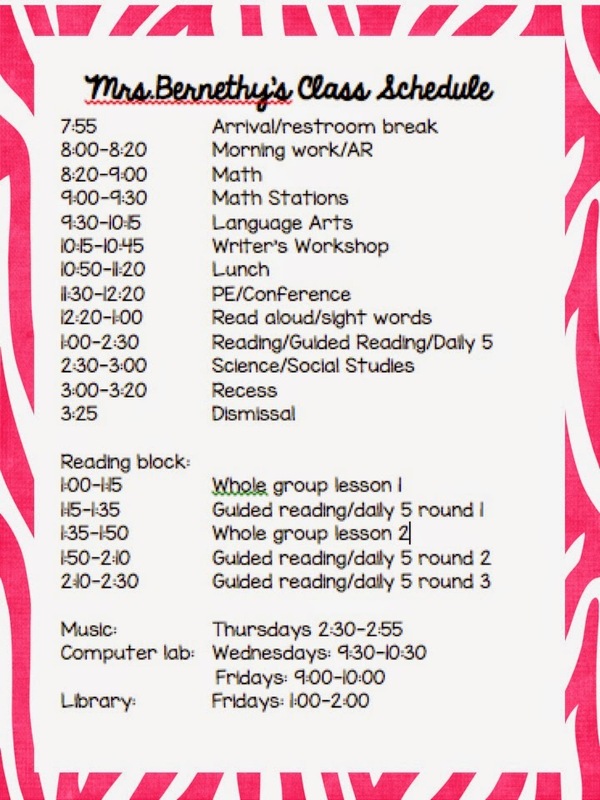 I teach two 15 minute whole group lessons with three 20 minute daily 5 rounds in between. We are starting our first story this week. I’m still working on establishing a D5 routine so we aren’t in the full swing yet. I alternate teaching science/social studies/health every two weeks. We will be wrapping up our character trait unit this week and doing some 9/11 activities for Patriots Day. I only teach these 4 days a week because we go to our Pep Rally every Friday afternoon. You can click on any of the pictures to take you to my plans. From there, just click on the unit cover page to take to you the link on TPT or blog. 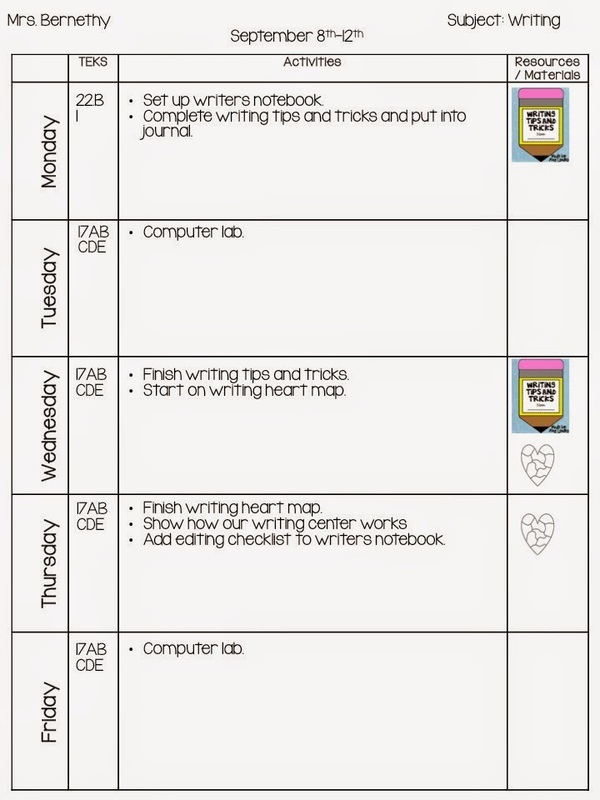 I’m going to do my best to post my plans each week. Don’t hold it against me if I miss a time or two.